Most of us have t-shirts. Some of us have a lot of t-shirts! They might provide special meaning or a reminder of a time or event, or accomplishment, or a special trip or vacation in our lives. Some people just love to collect them! Even though we might not wear them anymore (or maybe they don’t fit 😉 ) it can be hard to let go of that piece of clothing! We meet customers over and over, of all ages that tell us about their dresser drawer or box of t-shirts they have, and that they were just trying to figure out what to do with them. Wherever they have moved, their box or pile of shirts move with them. 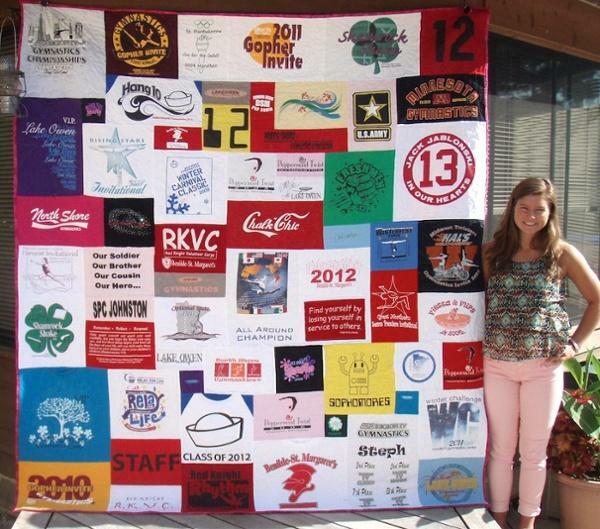 A custom t-shirt quilt, made with professional quality, is a great way to create lasting memories that can be passed on to your family for generations. Our quilts are meant to be used and admired and remind you of those happy memories. Memory quilts from clothing are probably the quilt we make that has the biggest impact on both my customers and myself. Losing a loved one is painful and a loss that is felt for many years. 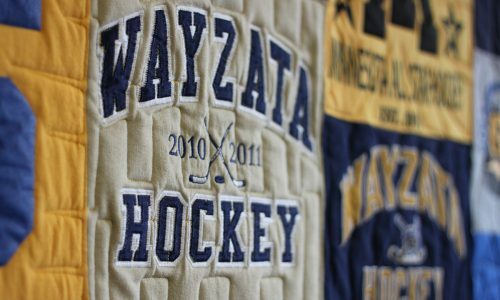 One way to honor your loved one’s memory and at the same time provide comfort and warmth is to have a quilt made out of your loved ones clothing. 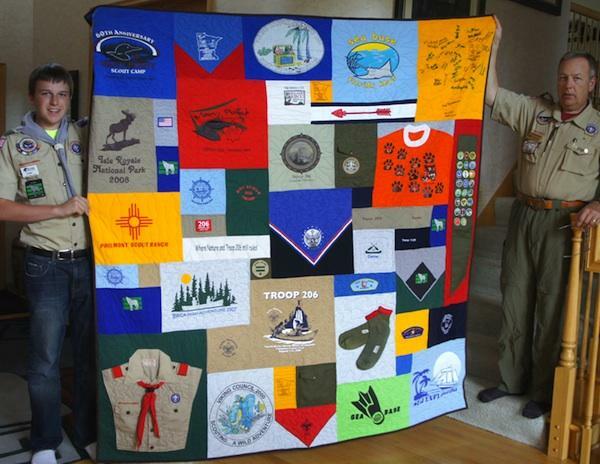 Memory quilts can be made out of T-shirts and any other clothing items that are washable; jeans, polo/golf shirts, blouses or men’s dress shirts to name a few. When you aren’t sure what to do with special clothing or just want to cuddle up with your loved one’s memories, a memorial quilt is a wonderful and thoughtful option. 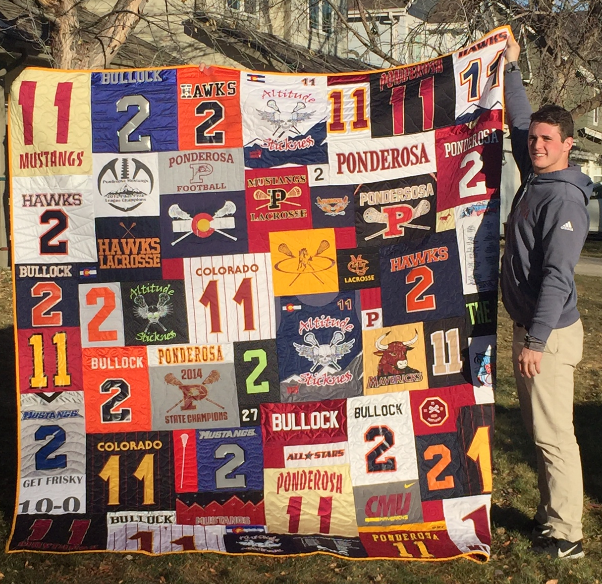 Whatever your special interest or sport, Minnesota T-Shirt Quilts can make those clothing items into a timeless memory that can keep you warm forever! From Harley shirts, hockey/sport jerseys, baby clothes to dance costumes we are always ready to take on a new theme! We use the same quilt style and are experts in the random block placement. We finish your quilt with unique and custom quilting, turning your passion into a functional piece of art! Football, basketball, hockey, baseball, softball, and lacrosse. Do you have a bunch of old uniforms from all those teams and years of dedication to your sport? These quilts look great and put a smile on your face! If you don’t have enough shirts, or if you have too many, a pillow is a great option for those extra shirts. 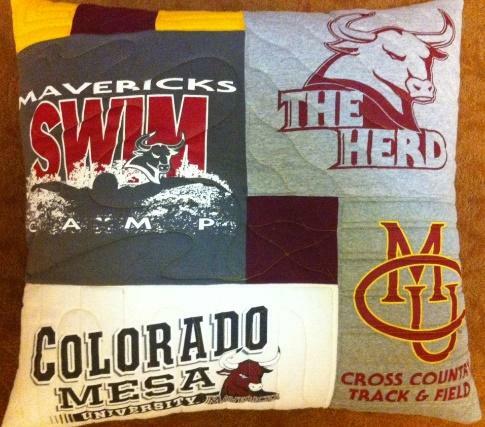 Our pillows are 24 x 24 inches making them great to use on a couch, bed, or the floor and the college kids love them! The quilts made it today! I took them out of the box and laid them out and just stared at them. They are beautiful. The detail is amazing.